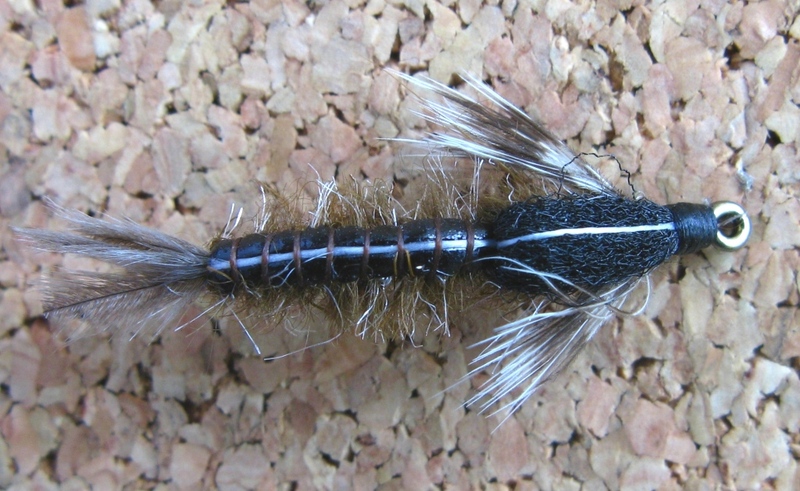 This entry was posted in Fish Stories and Other Tales, Fly Pattern Recipes, Wet Fly Photos and tagged Don Bastian, Fish On, Golden Stonefly Nymph, Isonychia Nymph, Nymphs, Slate Drake Nymph. Don, this was quite a humorous blog. You had the Wild Trout surrounding it, so it is cool. Hey throw in a fly sticker or two, and surely people will know what you meant. 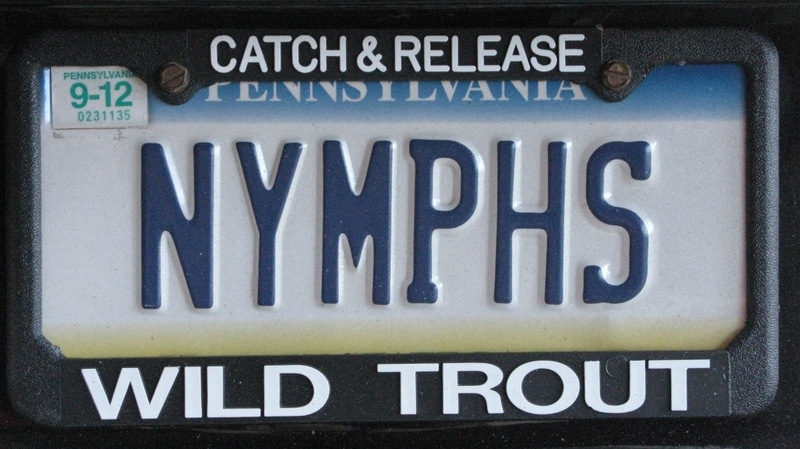 I think it is a cool license plate, but then again, I know what nymphs are…lol. 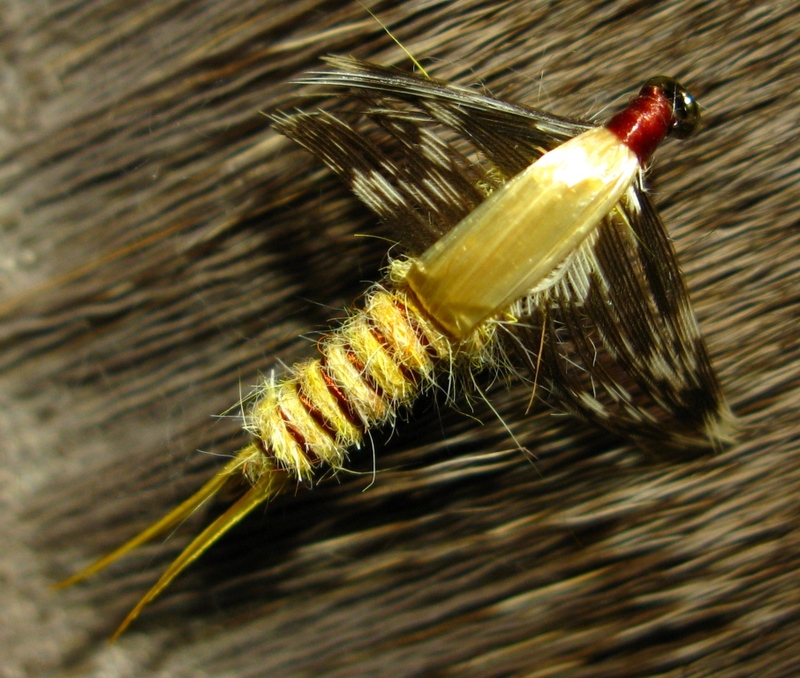 (well to fly people anyway) Your nymph ties here are SUPERB. Thanks for a great post to your blog. Thanks Kelly! As I indicated the double entendre meanings have played a role in making this fun. And funny! I’m glad you liked it. Thanks for your comment! Will Wooly Bugger fit on a license plate? Very great story Don. I agree with Lou Anne. Thanks for your comment, and no Wooly Bugger is too long; in PA it’s limited to 7 characters. Thanks again! 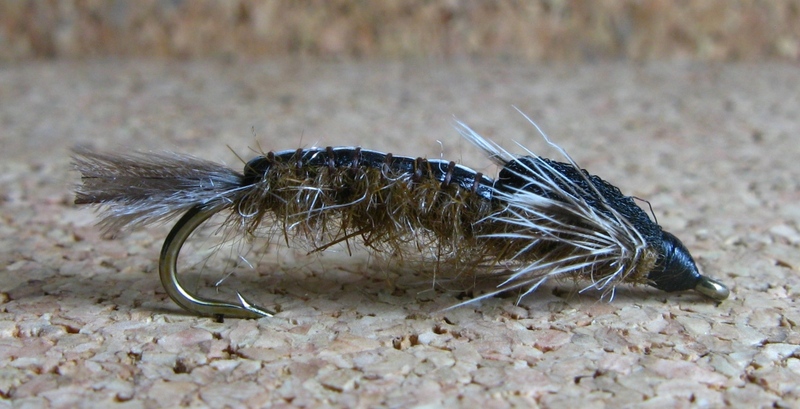 Those are some nice lookin “insect larva” Don…Love the plate and the story!..that’s makin a statement!…Here’s one to think about for a plate for you…” THE DON”!…I like it! Thanks Dave, and I appreciate your suggestion, and your compliments on the “nymphs” but I think I’ll be keeping my NYMPHS plate on whatever I drive. Why not? !! Thanks Mark! I intend to put the recipes on; I knew I wouldn’t have time yesterday when I made the post, and I stopped here on my way from a trip only to get more coffee and a few more tying items…heading back to the cabin now for lunch and an afternoon of fly tying & camaraderie. Thanks again! Don that is one for the ages… hilarious!! Just terrific. 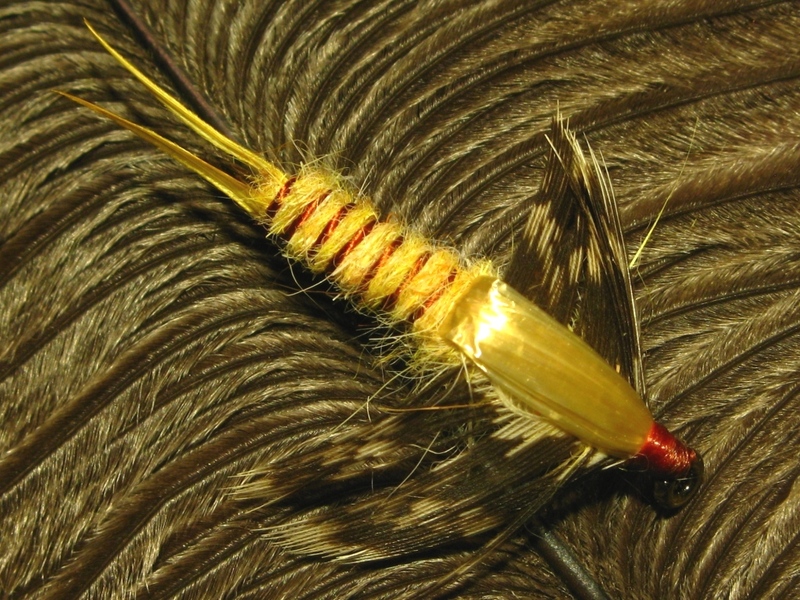 Here is to a great fly tyer and fellow fisher. Thank you for your comments! The recipes have been added, and I appreciate that you folks have enjoyed this post! Thanks again! Nymphs, what’s the big deal? Now going with, Satyr, on your license plate, that might be a reason for one’s wife to get upset over. My wife of 34 years never did get upset over it, she enjoyed the humorous side of it. But the second wife of a failed marriage, oh yeah. She hated it. The Jeep Compass we bought together in 2009; it’s my car now, and getting the NYMPHS plate put on my car was an act in defiance to her and victory for me. I play the stereo louder than she would have too…thanks for your comment. I’m going to see if “Satyr” is taken here in Alberta! Hi Jon! That is really, really funny! You and I could get together for some fishing, and park our cars next to each other. Wouldn’t that be a hoot? People would wonder, but that’s the joy of it! 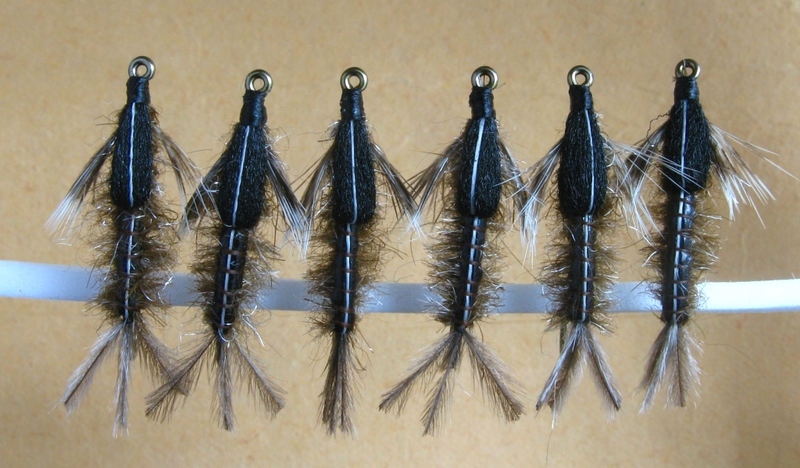 BTW, I am about ready to start on your custom wet fly order…been busy catching up on fishing fly orders, and of course, since it’s been entering prime time for hatches and good dry fly fishing, sulphurs on Spring Creek, March Browns and Green Drakes on Penn’s Creek, Brown Drakes imminent on Big Pine Creek, I must periodically yield to temptation and on occasion, go fishing. Besides I am field-testing some new patterns too. Thanks for your comment! Cheers, SATYR!